A public political manifesto by former Solidarity leader Lech Wałęsa at George H.W. Bush’s funeral. 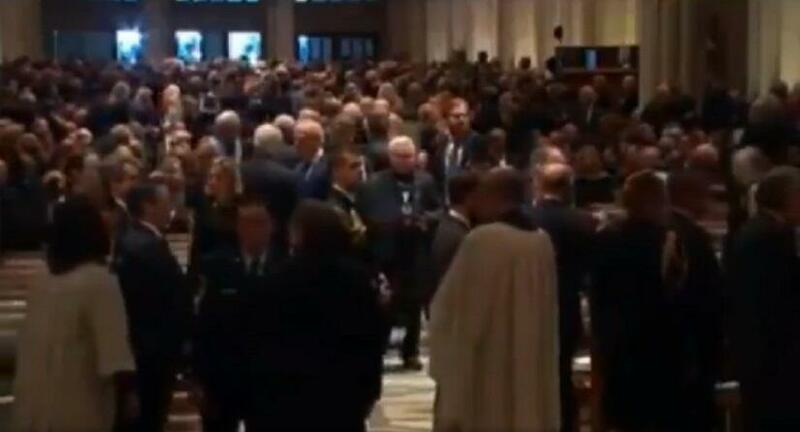 Wałęsa attended the funeral dressed in a “Constitution” shirt, provoking disgust from commentators. A short video showing the legendary "Solidarity" leader has been making the rounds on Polish social media. In it, Wałęsa is dressed in a "Constitution" shirt and looked lost at the funeral. No one was paying attention to him. At his own request, Lech Wałęsa was invited to join President Andrzej Duda on his flight to George H. W. Bush’s funeral. Spychalski also commented that Wałęsa and Duda of course conversed during the flight, as the two men were sitting next to each other. “We are above the current, political conflicts in our country,” he said.